For more SOOC photos, visit Slurping Life. Magic Marker Monday: "Exciting Land"
Cuddlebug and Bearhug each brought home their writing folders at the end of the school year, and I've really been enjoying reading through them :). Here's a story written by Cuddlebug, titled "Exciting Land"
You can click on the pictures to enlarge so it's easier to read, or the text is below. 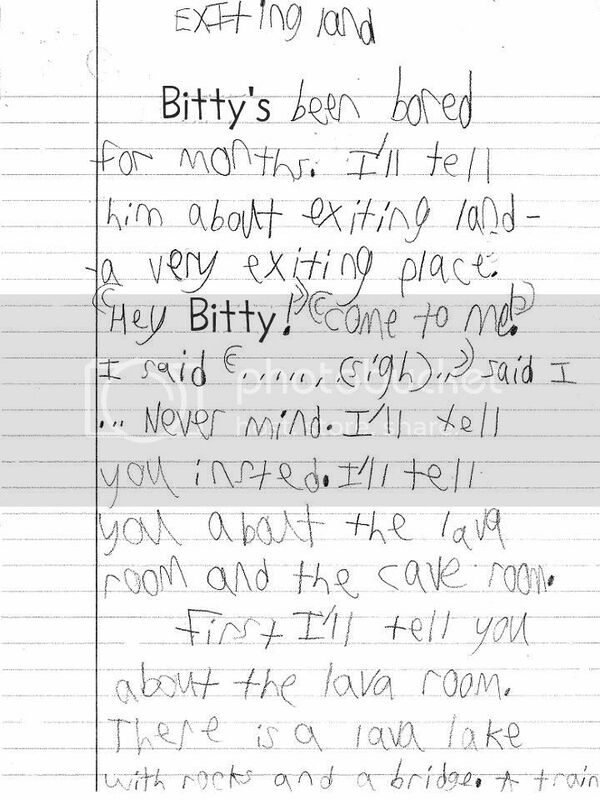 The only edit I did was to edit out Bitty's name and include translation on one word that's a little hard to read, the rest is pretty clear with great spelling :). I love his descriptions, and it made me laugh that Bitty's unresponsiveness in the story ("sigh... I'll tell you insted" lol) is pretty true to life. And can I just say, his handwriting here is great! He has been working really hard on that. Bitty's been bored for months. I'll tell him about exiting land - a very exiting place. "Hey 'Bitty'!" "Come to me!" I said. ".......(sigh)." said I... Never mind. I'll tell you insted. I'll tell you about the lava room and the cave room. First I'll tell you about the lava room. There is a lava lake with rocks and a bridge. A train goes on train tracks that go over this hot smelling lake. 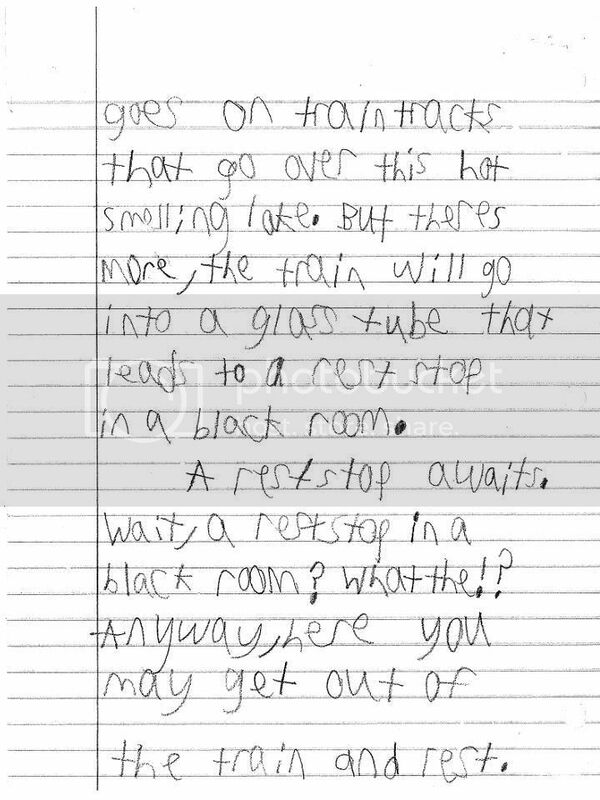 But theres more, the train will go into a glass tube that leads to a rest stop in a black room. A rest stop awaits. Wait, a rest stop in a black room? What the!? Anyway, here you may get out of the train and rest. Now I'll tell about the cave room. 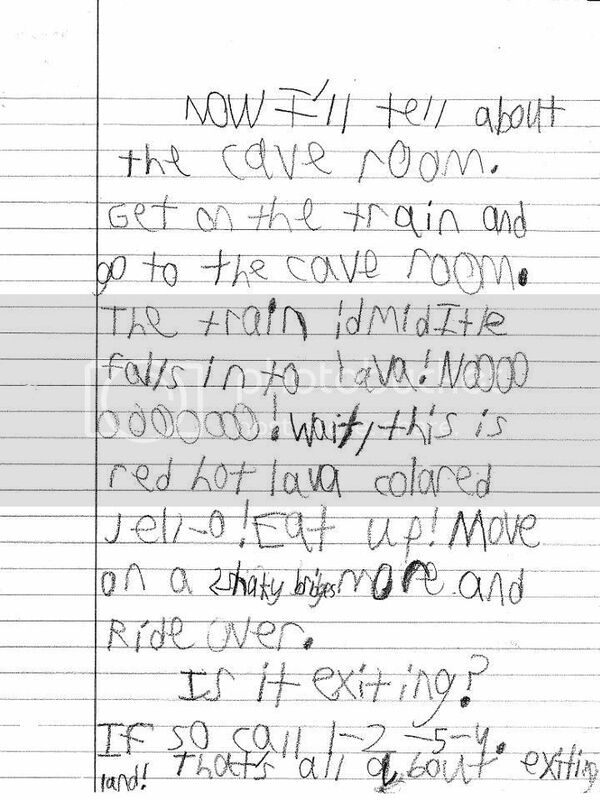 Get on the train and go to the cave room. The train idmidItle [immediately] falls into lava! Nooooooooooo! Wait, this is red hot lava colared Jell-o! Eat up! Move on a 2 shaky bridges more and ride over. Is it exiting? If so call 1-2-5-4. That's all about exiting land! A few weeks ago, as the school year was winding to a close, I kept feeling like something was missing. It wasn't until a friend of mine mentioned her daughter's pre-k graduation that I realized what it was. Next year, Bitty will go on to Kindergarten with his 5-yr-old peers (with resource support, but he will be in a class with his same-age NT peers for the first time). 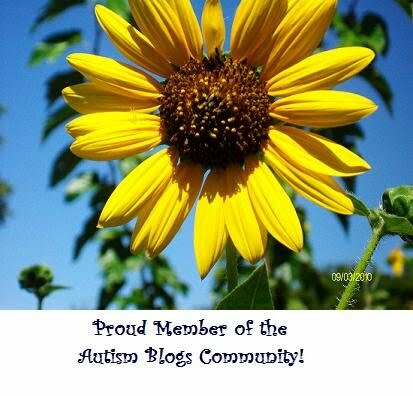 However, since he was not in an actual pre-k class this year (he was in a class that combined 3-yr-old NT children and 3-4 yr old children with special needs), he didn't have a pre-k graduation. You would think a small detail like that would be no big deal, but for reasons unknown I was really bummed about it. Then at the end of the year he brought home in his backpack what looked like a little "diploma," rolled up and tied. I got all excited thinking they must have gone ahead and given the 4-yr-olds in the class who were moving on to Kindergarten a "graduation" certificate. Then I unrolled it and saw it was general certificate for doing a great job in school this year. At least no one saw me. The boys were all in bed and dh was out in the garage. I really don't know why it bothered me so much. 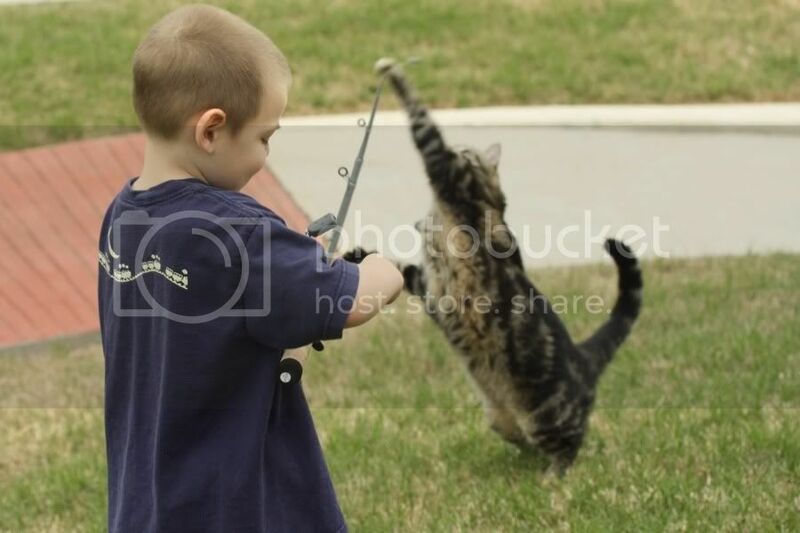 Bitty wasn't at all disappointed, he wasn't expecting a pre-k graduation and would have probably been indifferent even if he'd had one. He did have a nice end-of-year party, and it was a cute certificate. Maybe because I hadn't really thought about it and it caught me by surprise. Hopefully it's not just because I'm crazy ;). It didn't last long... I carefully placed his certificate in the office with his artwork and other school papers. I am really proud of him, and "graduation" or no, he's going to have a great time in Kindergarten next year! 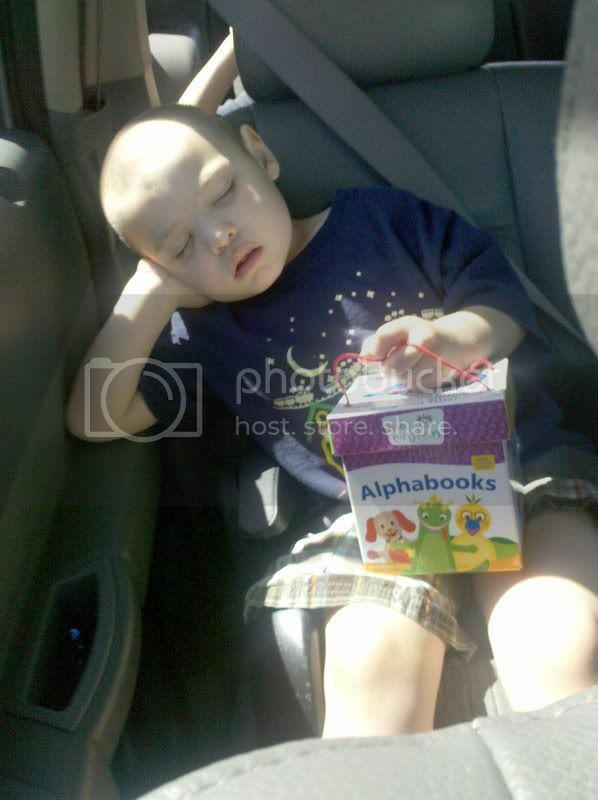 Mr. Bitty asleep in the car on the drive back home, still clutching his beloved "Baby Ei-stei wetters," the alphabet books that were a much-awaited birthday gift :). Bitty's sense of humor cracks me up. I love his "jokes." One of his favorites is the "day of the week" quiz. "You're right, today is Saturday." "Tomowwow iss Sunday. Church on Sunday. You wear da horse on Sunday." (We taught him the "horse on Sunday" rule to get him to wear his polo shirts instead of Thomas, at least long enough to go to church... he has nice shirts that aren't Polo but we haven't been able to successfully expand the rule yet). "Today iss TOOOZ-day!!" and he laughs hysterically at his own clever joke. "Today is not TUESday, silly!" "Hahahaha!!! Today iss WEZ-day!!" more giggles to the point of hiccuping with laughter. I play along, exaggerating my tone and laughing with him. "Nooo, today is not WEDNESday!" He cracks up like it's the funniest thing he's ever heard. "You do not to want WEZ-day!!!" He can go on like that through all the days of the week, laughing heartily at each one. I love his sense of humor, and the fact that he thinks the days of the week are so funny. I love his laugh and will keep playing along just to hear it :). Now he's learning the months and their sequence, it's probably only a matter of time before he starts cracking jokes about what month it is :). Cuddlebug and Bearhug walked several feet ahead of us. Well, ok. "Bounced" is more accurate than "walked." Imagine Tigger with a twin brother, and you'll get the idea. They looked up, down, sideways, even behind them, anywhere but right in front of them. "Watch where you're going, guys." They bumped into some people walking the other direction. Then another near miss as they looked back at us when we reminded them again to pay attention to the space in front of them. Sometimes they ran ahead, making it hard to keep up. But just as we'd get close, one of them would spot something intriguing and stop in his tracks. Anyone following too close would have tripped over him. We'd slow down but keep walking, keeping an eye behind us and calling out for them to keep going. If we stopped, who knows how long they'd stand there looking at whatever had caught their attention. Not to mention, the next thing they noticed might be back in the other direction and then we'd be backtracking. "Come on, let's keep going." "Slow down, wait for us." Seems like that would drive them crazy, but if I'm lucky, they might actually hear me maybe 1/3 of the time. Too many sights and sounds competing for their attention. I can't even remember the last time we went to the mall, but it was too rainy to go to the park, and all of the boys needed new shoes. It wasn't too crowded... more so than the average weekday but not as bad as a Saturday. I'm loving that they are so tall now... it is much easier to keep them in visual range now that they are about shoulder height relative to the crowd. It was so hard when they were toddlers, barely knee height, slipping out of their stroller buckles and running off in different directions. How many times did we end up pushing an empty double stroller and chasing after them? Pretty soon they'll be tall enough to be spotted above the crowd, and then it will be even easier to keep tabs on them when we go out ;). We still kept a close eye on them, because although being tall means we could see them easily, it also means they have long legs and could quickly get too far ahead. We watched for any signs that the overstimulation was getting to be too much, always mindful of the exits and the distance to our car (I dare say we are something of experts in rapid escapes when necessary), but they actually handled it pretty well. I couldn't help but smile at my big boys being themselves. I also couldn't help but notice how calm Bitty was in comparison. He reached for my hand as soon as we started walking and walked beside me. He didn't run. He didn't zig-zag. He didn't bounce. He just walked. Holding my hand all the while. While crowded places overstimulate Cuddlebug and Bearhug and make them even more hyperactive than usual (and if you know them, that's saying something! ), the same crowds, especially in an unfamiliar place, sometimes make Bitty a little nervous and more mellow than usual (because he does plenty of running, bouncing, and crashing when we're somewhere familiar). We managed to find shoes for Bearhug and Cuddlebug - and on sale too! (sales prices AND buy one-get one half off). Bitty refused to try on anything other than Thomas shoes, and we couldn't find any in his size. I'm still looking for some online, but he is reaching the point where Thomas items are harder to find in his size. Luckily for me (and my back) Bitty lasted right up until it was almost time to leave before he started asking to be carried. By "asking," I mean dancing around in front of me, making it impossible for me to walk, saying, "You wan' da up? Aww done wif da down-er?" "How do you ask?" I prompted him. "Up, pweez!" he answered happily, arms in the air. And so with that, I lifted him up and we headed for the car. I can say I got my exercise for that day ;). Cuddlebug: "Hey, Mom, how old am I?" Me: (thinking he must be asking something else because he knows how old he is) "What do you mean?" Cuddlebug: "Am I older than 'Bearhug'?" Me: (aha, so that's the real question, although we've actually talked about this one before) "You were born two minutes before 'Bearhug', yes." 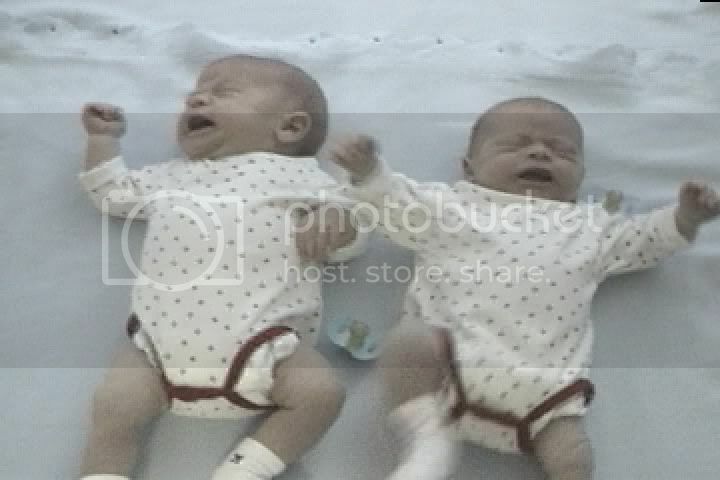 Call me crazy, but the whole concept of "older" and "younger" twins has never really made sense to me since birth order is a matter of location (ie. who's closest to the "exit"), and not really a matter of "age," per se. 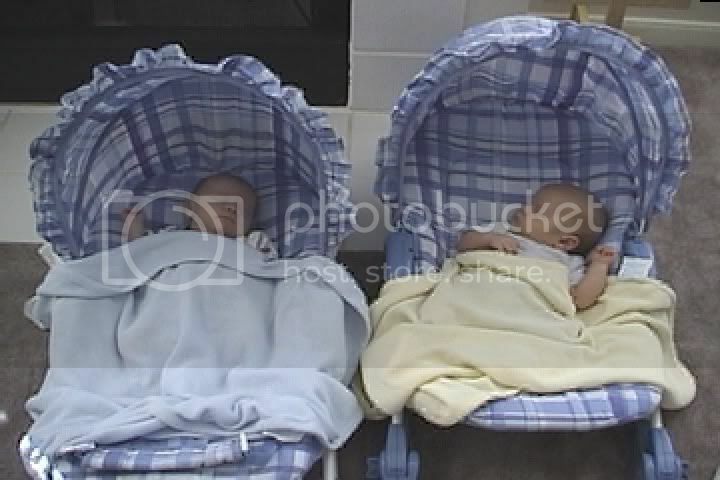 Especially in the case of identical twins, as my boys are, who are literally conceived in the exact same moment. So I prefer to say "born first / second." Cuddlebug: "Then why is 'Bearhug' stronger than me?" Me: "um... aren't you both the same 'strong'?" Bearhug (at the same time, in a matter-of-fact tone): "No, I'm more powerful." Cuddlebug: "Yeah, he is. Hey, I thought I was ten minutes older!" Me: "No, it was two. But it's not a big deal. And it's not a big deal who's stronger because you're both strong." They seemed unconvinced, but they moved on to talking about dinosaurs and dragons and other such things. 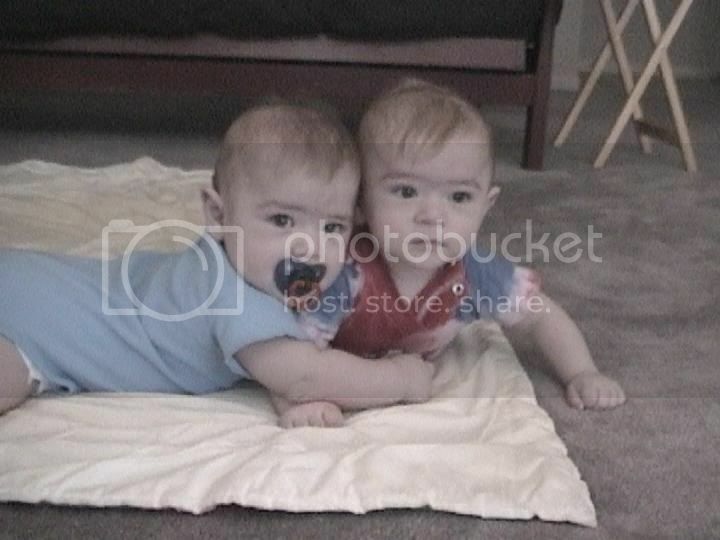 As of 10:31pm (and 10:33pm) yesterday, Cuddlebug and Bearhug are officially nine years old. 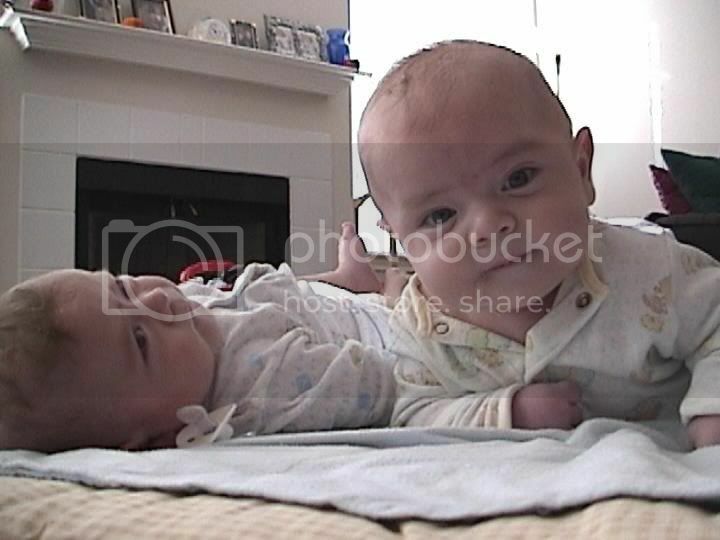 They came into the world weighing nine pounds, nine ounces (combined - Cuddlebug was 4 lbs 1 oz, Bearhug was 5 lbs 8 oz.). So to celebrate, I decided to share nine SOOC (straight-out-of-camera, no editing) photos from their first year. Please ignore the grainy look, these are all from my camcorder. Cuddlebug (left), Bearhug (right). 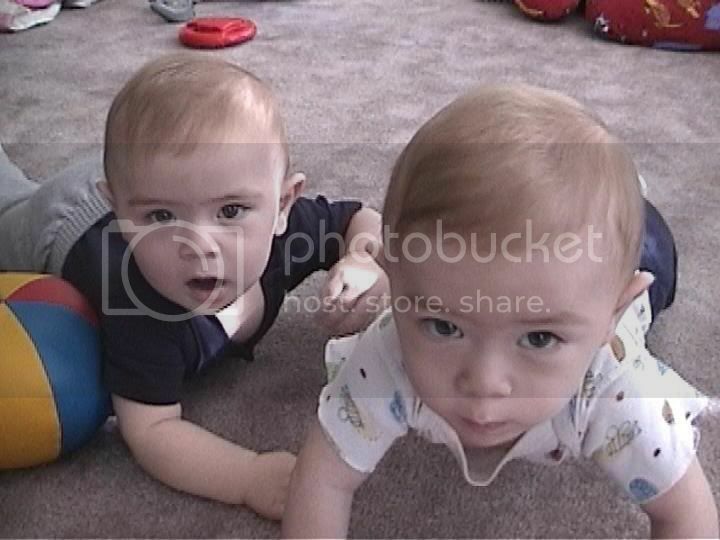 This was taken on their first birthday. Sigh... 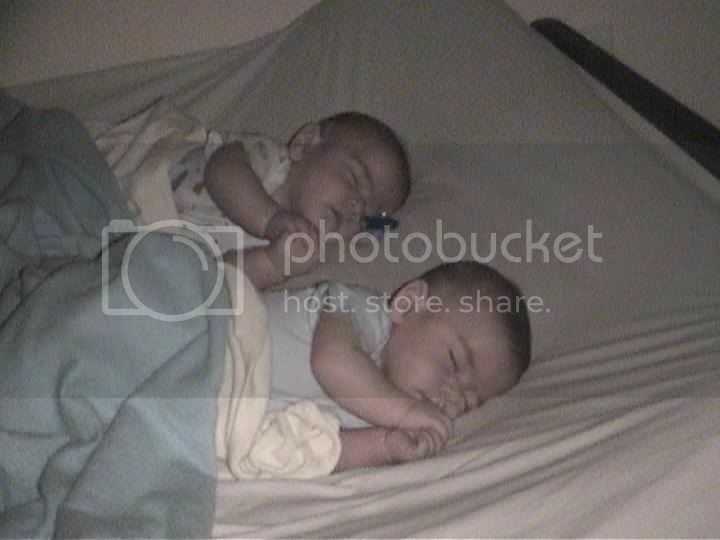 I miss when they were so little :). Well, minus the zombified sleep-deprivation of course. 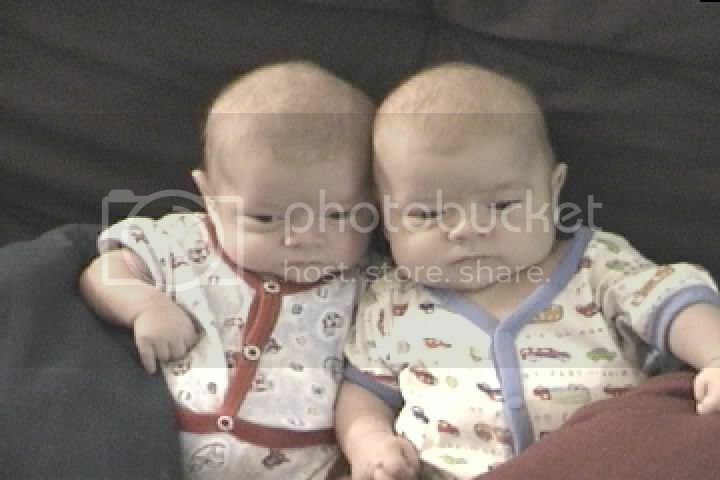 Other than that, I miss when they were so little ;). We've given the boys a few days off to relax and enjoy the start of their summer, but soon it will be time to start up our summer homeschooling activities. It's something we've done since Cuddlebug and Bearhug were in preschool. It helps maintain structure during the summer, and also helps keep them on track academically. We can expose them to topics in the summer that we know they'll be working on in the next grade. Then it's at least somewhat familiar when they come to it again in school, which helps their confidence and offsets some of the impact of needing to take sensory breaks and such during the school day. It's also a chance to teach them things that the school curriculum may not cover, or may touch on but not go in depth (such as history or science topics). * Math - more advanced practice with fractions, division, etc. They like to read so that part should be easy :). I'll be helping with the writing part, because although dh is a gifted teacher, writing is not his thing. I'll try to help with the rest as I can, but realistically it will mostly be dh as he's the one home during the day. For Bitty, we still have a lot of the Kindergarten workbooks and materials from a few years ago that he can use. Our main focus will be to work on his hand strength and fine motor control for writing and drawing, as well as basic math concepts. He reads all the time so there's no need to set aside "school" time for that :).